VV records, presents: Still Wielding The Old Magic! - as Additional content a 43x30 art print. 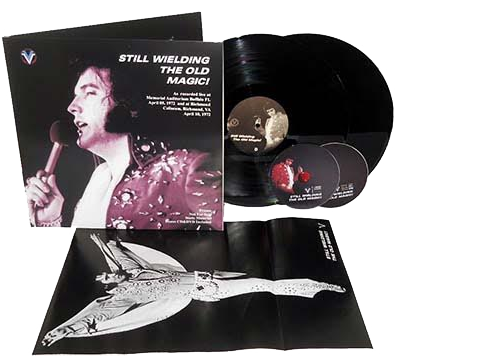 Double vinyl 150 grams, including the incredible Richmond show with the best audio possible!! A Soundboard recording from the improved sound FOR THE FIRST TIME in a double high valued collector vinyl set, 33 rpm speed. The CD, including The Tour Opening Show , Buffalo April 5, 1972, in a completely unreleased Audience recording with a decent audio. This recording come from an early generation copy of the master tape, the sound quality is very good considering the early arena show. We have on our hands the original mono tape of extremely good quality enabling us to carry out simple re-mastering work, concentrating on the reduction of noise trying to achieve a more clear sound and of Elvis in matter to deliver the best audio possible for your listen pleasure. The DVD here presented has been professional edited, all the footage has been carefully remastered in the matter to delivery the best video to date!!!! The result is unbelievable forget the cheap dvd that are floating around …. . All the footage includes matching audio from the original concert in the way to get a perfect sync between audio and image with speed correction of the original footage. We think and we hope you can enjoy this new product, if you love Elvis on tour you can't miss it!! Please stay tuned for our next release with the second volume dedicated to ELVIS ON TOUR! NOTE : All the footage has been digitally restored in matter to achieve the best result on the image quality. All the footage includes matching audio from the original concert in the way to get a perfect sync between audio and image. As for the cd: The intros came after Suspicious Minds and are missing on the cd-r. Here there were copied from another show me guesses and inadvertendly pasted after American Trilogy. Very amateurish. They obviously took the cd-r which means sound below average. My advice....forget this C-R-A-P. or..for vinyl collectors only.